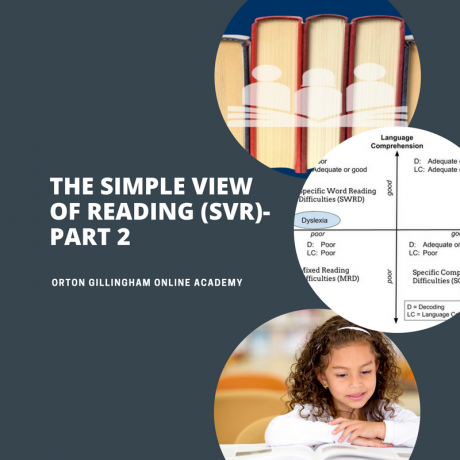 The Simple View of Reading Part 1 is an introduction to this reading model. In this second part, I will introduce you to the reading profile “Specific Comprehension Difficulties” or SCD. At its most extreme this has been labelled “Hyperlexia.” In Part 1, I introduced a visual representation of the four reading profiles, and I’m using this again here, but this time you will notice I have now added the label “Hyperlexia” to the bottom right quadrant. This will be the focus of our blog today. For a student with SCD, we see a profile where phonemic awareness and decoding have to be better than average, but reading comprehension is below average. Oral vocabulary and listening comprehension is often weak, as is fluency, but this is due to language difficulties, not poor decoding abilities. These students display good foundational reading skills, but their problems are with the higher order thinking processes required for language and reading comprehension. It is important to remember thinking processes aren’t skills as such, and as a result they are difficult to quickly remediate. Regular guided practice will make a difference as the student matures, because our thinking processes continue to develop throughout our lives. These students typically do well in the early grades when vocabulary and comprehension aren’t being stressed, but as the emphasis shifts from “learning to read” to “reading to learn,” they start to fall behind. I discussed this previously in my blog A Ride Through the Reading Stages. See below for a discussion of resources that can be used to help this group of students. There can be a number of causes for these kinds of difficulties, and it is very important to establish a student’s specific comprehension needs before selecting the intervention. Situations of poverty can impact vocabulary knowledge as much as a language disability. Students for whom English is a second language (ELL) can often decode words, but lack understanding of their meaning and how they can be used. In these cases it is important to work on building a student’s vocabulary knowledge. Elsa Cárdenas-Hagan talked about these issues and how to address them for ELL students in her presentation, Differentiated Language and Literacy Instruction for English Learners, given at the AIM Institute 6th Annual Research to Practice Symposium. A related problem can be a lack of the background knowledge necessary to understand what they are reading. If either content or words are not familiar, comprehension will be limited. Perhaps surprisingly syntax weaknesses can also degrade comprehension. In English, it is critical to understand the significance of the order and arrangement of words and phrases which create meaning. These difficulties could be caused by a lack of exposure to English; sometimes seen in situations of poverty and/or cultural differences. Julie Washington Ph.D, discusses these issues in her presentation Growth of Language and Literacy in Low-Income African American First through Fifth Graders, from the same AIM symposium I mentioned before. Other students may have difficulty inferring meaning from both speech and written language. This may impair understanding of narrative text, which tells a story. Students with these kinds of difficulties may be on the autism spectrum, and/or they may have a semantic pragmatic language disorder. In other words, they have problems understanding the meaning of what is being said to them; this is the semantic aspect of language. They may also struggle with using language appropriately in a social situation; which is termed the pragmatics of language. These difficulties have been labelled “Hyperlexia.” Hyperlexic students can generally read a text well, but have difficulty comprehending it. The word, hyperlexia, means reading words above and beyond (hyper) their understanding, making both spoken and written language difficult to follow. More generally, this is called a receptive language difficulty. These students would greatly benefit from a language evaluation by a speech-language pathologist. 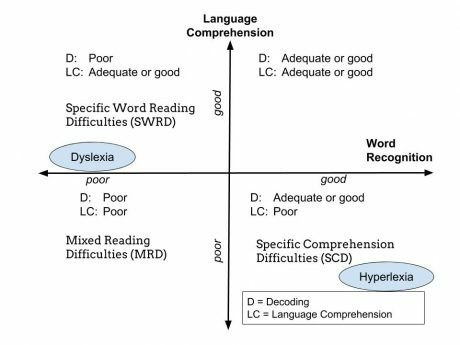 As you can see, SCD is a language problem that is impacting reading, rather than a problem that affects the basic reading skills, such as dyslexia. This condition can only be remediated by addressing a students language difficulties, and working with them to develop reading comprehension strategies. David A. Kilpatrick, in his book “Equipped for Reading Success,” tells how teachers often referred to students with hyperlexia as “word callers.” However, he reminds us that ELL students, often function like hyperlexics until their knowledge and understanding of the English language improves. Kilpatrick is keen to point out that there is a mistaken idea in the educational community that “word calling” is a result of teaching phonics, or not emphasizing meaning in the teaching of reading. However, it has been proven that children taught phonics in first and second grade have better comprehension at the end of second grade, than those taught only through whole language based approaches. This is because the students who are taught phonics can read far more words and therefore better understand what they read. By fourth grade, these comprehension differences are usually no longer seen between the two groups, which proves that phonic teaching does not produce “word callers.” For a more in depth discussion of Hyperlexia, please read Dr Michael Hart’s blog on this subject. ● For those having difficulties with vocabulary the book, Bringing Words to Life: Robust Vocabulary Instruction, comes highly recommended by David A. Kilpatrick and Marisa Bernard of the Orton-Gillingham Online Academy. ● In our practice, we use the supplemental online program, InferCabulary, to help build our students’ vocabulary, especially those students who have receptive and expressive language difficulties. ● You may also find the vocabulary section of Lynn Given’s Connect to Comprehension course useful when working with students with vocabulary problems. ● Lynn Given’s has produced a webinar that might be helpful for those working with students with comprehension issues because of syntax and grammar problems. ● I have also taken the online multisensory grammar course by Neuhaus. ● A further helpful resource available from the Orton-Gillingham Online Academy is their manual, Developing Essential Grammar Skills. I have already referred to some of these resources in my prior blog, A Ride Through the Reading Stages. ● Erica Warren’s Making Inferences, Abstract Thinking and Multiple Meanings, and Visualization downloadable resources. ● Susan Zimmermann’s 7 Keys to Comprehension” are all used in the course we created. 1. I’d like to thank The AIM Institute and Dr Louise Spear-Swerling for providing the Access to the Experts Community Speaker Series session, How Understanding Profiles of Reading Difficulty Can Help You Help Your Child. A recording of this presentation along with her handout is now available for free through the AIM Institute and will be until October 5th, 2018. The AIM Institute has also made available all of the presentations given at their 6th Annual Research to Practice Symposium.